Schumer Urges Feds To Increase Their Share Of Sandy Recovery Costs To 90% From 75%. Washington D.C. - May 1st, 2013 - U.S. Senator Charles E. Schumer today urged the Federal Emergency Management Agency (FEMA) and the White House to increase the share the federal government is paying for repairing public property damage by Superstorm Sandy from 75% to 90% or more. Federal law requires that FEMA pay at least 75% of eligible costs after a disaster, and once federal obligations meet or exceed $133 per resident, FEMA can recommend the President to adjust the federal costs share up to 90% or more. New York crossed this critical threshold yesterday - Schumer today called on FEMA to move forward with this request in order to prevent local taxpayers from holding the bag. 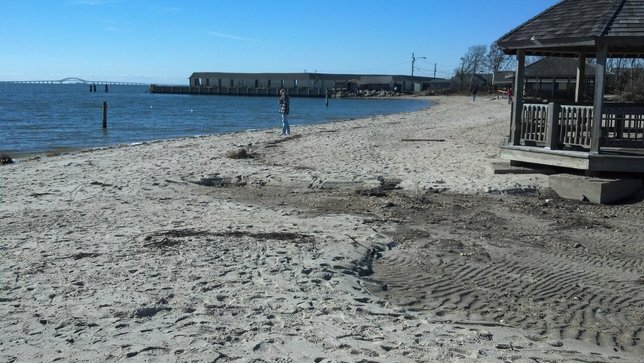 "The impact of Hurricane Sandy on Long Islanders has been devastating," observed Hempstead Town Supervisor Kate Murray. "Local governments and taxpayers could be slammed again - this time by a storm of Sandy related debt - if the federal government does not pay for the lion's share of superstorm recovery costs. I want to thank Senator Charles Schumer for pushing to get Sandy impacted Long Islanders the federal recovery monies we need. On Long Island, we spell hurricane relief 'S-C-H-U-M-E-R'." “The devastation of Superstorm Sandy is still with us and will be for months to come. Senator Schumer continues to assist the residents of the Village of Freeport and we cannot thank him enough for his efforts. It is this increase in assistance which will allow the Village to make much needed repairs, and continue to provide services to its residents. On behalf of all Freeporters, I thank you, Senator Schumer,” said the Village of Freeport Mayor Robert T. Kennedy. "On behalf of the Long Beach City Council, I want to sincerely thank Senator Schumer and everyone who was involved in helping us obtain this critical reimbursement money,” said Len Torres, Long Beach City Councilman. The Robert T. Stafford Disaster Relief and Emergency Assistance Act allows the President to adjust federal cost-shares for FEMA’s Public Assistance Program. The Stafford Act requires FEMA to pay at least 75 percent of eligible costs, including repair, restoration and debris removal. Once federal obligations meet or exceed $133 per capita of the state’s population ($2.6 billion in the case of New York), FEMA can recommend the President to adjust the federal cost-share from 75 percent to 90 percent. On April 30th, the Long Island Power Authority (LIPA) was obligated over $267 million through FEMA’s Public Assistance program for Superstorm Sandy. With this obligation, New York State has exceeded the $133 per capita requirement and FEMA can now recommend that the President adjust the federal cost-share. Schumer today urged FEMA to move forward with a recommendation to President Obama that would adjust the federal cost-share from 75 percent to 90 percent. Schumer noted that, in the past, FEMA has almost always made such a recommendation to the President. Schumer made the case that between FY2006 and FY2010, more than 19 disaster declarations have had their cost share adjusted from 75 to 90 percent. Schumer explained the enormity in which Superstorm Sandy damaged New York State; the storm destroyed homes, businesses, and infrastructure and has cost New York State billions of dollars to repair. Schumer went on to say that Superstorm Sandy victims in New York have already laid out hundreds or thousands of dollars because of the storm and that this federal cost-share adjustment would save local taxpayer money. I write in strong support of a recommendation to adjust the federal public assistance cost share for the New York Hurricane Sandy (DR-4085) major disaster declaration from 75 to 90 percent. In the coming days, with the obligation of Project Worksheet 367, public assistance obligations for DR-4085 will exceed the threshold for New York set by the Stafford Act which allows the Federal Emergency Management Administration (FEMA) to recommend to the President to make such an adjustment. On behalf of the communities in my state that were devastated by Hurricane Sandy and are still recovering, I urge you to make a recommendation to the President calling for a 90 percent cost share for DR-4085. As you are aware, The Robert T. Stafford Disaster Relief and Emergency Assistance Act (The Stafford Act, P.L. 93- 288) contains discretion for the President to adjust cost-shares for the Public Assistance (PA) program. The Stafford Act directs FEMA to pay “not less than” 75-percent of the eligible costs for essential assistance (Stafford Act Section 403, 42 U.S.C. 5170b), repair, restoration, and replacement of damaged facilities (Stafford Act Section 406, 42 U.S.C. 5172), and debris removal (Stafford Act Section 407, 42 U.S.C. 5173). Once actual federal obligations under the Stafford Act meet or exceed $133 (2013) per capita of State population, FEMA can recommend the President adjust the Federal cost share from 75-percent to not more than 90 percent. The obligation of project worksheet 367 to the Long Island Power Authority on April 30th would cause DR-4085 to become eligible for a 90 percent cost share recommendation. After previous major disaster declarations have met or exceeded the requirement for a 90 percent cost share, FEMA has almost always made such a recommendation to the President. Between FY2006 and FY2010 alone, more than 19 disaster declarations have been had their cost share adjusted from 75 to 90 percent. Be it hurricanes, tropical storms, flooding, or tornadoes; FEMA has provided additional cost share relief to communities as they recover. Given the magnitude of Hurricane Sandy, which has cost the state billions of dollars in damages and destroyed homes and critical infrastructure, I urge you to come to the aid of many New Yorkers who cannot bear the burden of any more costs. I recognize the difficult fiscal reality facing our government, but we have always aided our citizens that have been impacted by major natural disasters. It is critical that we do the same for those affected by Hurricane Sandy. I am grateful for the prompt attention that you have given to this disaster and thank you for your attention to this matter. Please feel free to contact me at 202 – 224 – 6542 with any questions you may have. Subject: LongIsland.com - Your Name sent you Article details of "NYS Has Now Crossed Critical Threshold Allowing For Increased Federal Aid"